Did you know that 4 generations of one Arizona family have worked for Barrett-Homes Contractors? In 1948, Guy Ray Homes decided to join his brother in law, Roy Wood, at a construction company named Fuller Thomas. As Guy worked for Fuller Thomas he met Bud Barrett. 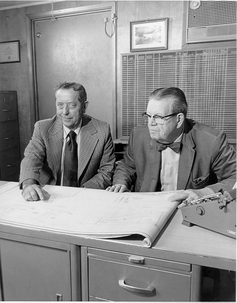 Bud was an engineer by degree and was the general manager for the Arizona office of Fuller Thomas. Fuller Thomas did insulation, pipe covering, and related specialty installations. They operated in Arizona, New Mexico, and West Texas. In late 1949, Fuller Thomas closed down their Arizona office. Guy, Bud, & Roy decided that they should start their own company. Bud & Guy formed the company and started business in January 1950 with Roy as their chief foreman. They started out with a small crew. Guy had always liked working with his hands so he ran the crews as field superintendent. On the other hand, Bud was more at home in the office leaning over a set of blueprints so he was the office manager. Roy continued to run projects as he had done for Fuller Thomas. In the beginning it was rough. They built a small warehouse onto the back of Guy’s house at 18th Street & Indian School. They installed cork insulation brought over from Portugal along with anything they could to keep busy. Bud had an office in his home doing sales, estimating, ordering materials, and billings. Eventually, the company grew and they needed more warehouse space. Guy moved his house & the warehouse to 10th Street & Bethany Home. In the early years, Barrett-Homes Contractors was one of the few acoustical contracting firms in Arizona. They had franchise rights from Armstrong Cork Company (now Armstrong World Industries). If Armstrong products were used in the Phoenix area, they were purchased from Barrett-Homes. In 1975 a prime new location for a new warehouse was purchased from the Sante Fe Railroad at 43rd Avenue & Indian School. This new location allowed the company to receive product by rail and stock 15,000 sf of product. Over the years, BHC has done Cold Storage insulation, Insulation, Demountable Partitions, Computer Floors, Acoustical Ceilings, Acoustical Wall Panels, Specialty Walls & Ceilings, Demolition, General Carpentry, and General Contracting.